The Netherlands with its dense population is, according to Menno van Duin (1995), disaster-prone. It is remarkable, then, that major accidents and disasters are rare events. However, the Netherlands has dealt with a high number of smaller technological disasters, especially industrial and transportation accidents (Van Duin, 1995: 185). One of the more recent major accidents in the Netherlands is the Bijlmer air crash disaster. On Sunday evening, 4 October 1992, an airplane from the Israeli company El Al crashed into two buildings in the Bijlmermeer, a suburban high-rise area in the Dutch capital Amsterdam (Boin, 2001). 31 apartments in the buildings Groeneveen and Klein-Kruitberg were demolished completely (National Geographic, 2016) and the area was turned into a garbage dump. The Bijlmermeer area, although once built as an experiment in ideal living, was a slum area and most of its population were non-registered immigrants. This made the identification process difficult and it was unclear how many people were present or had died during the disaster. Exact numbers of casualties were thus hard to estimate, but 43 people were eventually reported dead, including the captain and his crew, and 26 people were injured (Boin, 2001: 221). Investigation showed that the crash occurred due to the simultaneously crashing of two of the engines. Because a simultaneous failing of two engines is rare, rumours about a terrorist attack spread quickly. Although the first investigations did not prove this theory, people have held it to be true for a long time and some still do. However, the lack of evidence ruled out terrorism as the cause of the crash in official reports. Moreover, investigations showed that technical problems in the airplane itself were the cause of the crash and the rare simultaneous failing of two engines could be explained. All engines were connected to the wing by, amongst other things, a pin, which is designed to drop the engine when failing. Although the failing engine did fall off like it was supposed to, it hit the other engine which, consequently, broke off too. Not only was there no engine left on the right wing, the wing itself was also seriously damaged. The airplane thus was unable to reach the Dutch airport Schiphol and made a nosedive from 2500 feet high into the buildings in the Bijlmermeer in the municipality Amsterdam Zuidoost (National Geographic, 2016). I was exactly eleven months old when the crash occurred. Brought up living not too far from the Bijlmermeer area, I can not help but wonder if some people I have known or may still know have witnessed the disaster personally. Either way, the disaster struck my attention and I am therefore interested in how the event has been memorialized and what is still left of its memorialization today. In this essay, I will briefly discuss the development of the commemorative monument and outline my visit to it. After the crash, the municipality of Amsterdam Zuidoost established the Bijlmermonument working group, which had the task to investigate what kind of monument would be suitable for commemorating the victims of the disastrous event of 4 October 1992. Suggestions were made, but the task turned out to be more complicated than it seemed. Because of the variety of cultures represented in the area and thus the varying ways of memorialization, it was difficult to meet everyone’s expectations. Consequently, the first design of the architects Herman Hertzberger and Georges Descombes met with negative critique. According to the residents the concrete amphitheater, which was meant as a meeting place for relatives of the victims and residents, looked like a football stadium and the design thus had to be revised. In the meantime, a spontaneous meeting place was erected. After only a couple of days, people had started to memorialize victims and the disastrous event around a poplar tree close to the scene. The poplar tree, which used to be facing the buildings directly, miraculously survived the disaster and thus was called “the Tree that saw it all". Around this tree, people had started to leave wreaths, flowers, photographs, letters, poems and cuddly toys (Weilacher, 2005: 43). It did not take long for the Bijlmermonument work group to decide that this tree had to be the center of the monument and the idea for The Growing Monument was born: a monument that had to take shape in a natural manner in an open and public place, which would function as an accessible meeting place for residents and relatives of the victims. Four years after the crash the monument was inaugurated. Every year on the 4th of October people still gather at the monument to commemorate the disaster and the casualties. On a sunny Saturday afternoon, I decided it was a perfect day to go for a little bike ride to The Growing Monument to conduct my fieldwork. After getting somewhat lost in the Bijlmermeer area, I finally arrived at a peaceful park within the midst of it a white, concrete wall. It was The Growing Monument. 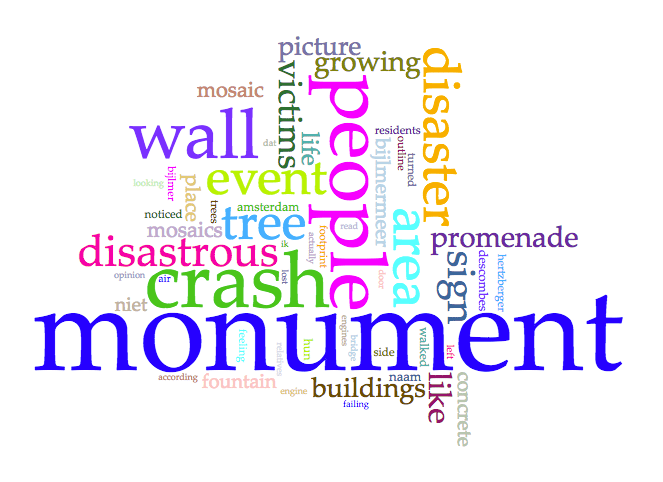 Having done some research beforehand, I knew that the monument consists of several components, which all can be traced back to the disastrous crash in a metaphorical way. Amongst these components are the wall, “the Tree that saw it all” that I mentioned earlier, the promenade and the Footprint, which I will all outline later on (Descombes and Hertzberger, 1999: 7). I stopped and took a moment to look around and explore the surrounding area. There were a lot of people walking or biking through the park, but none of them seemed to have the intention to stop and sit down, let alone paying the monument a visit. I do have to admit that from where I was standing, the monument seemed like a useless, concrete wall with a couple of see-through holes in it and I thus wondered if people would actually know what the wall meant while passing it in a hurry. I locked up my bike and walked closer to the monument. While I was coming closer, I discovered a plaque on the wall. The plaque explained what had happened almost 24 years ago and that it was part of a monument to commemorate the event. One of the first things I noticed when I approached the monument was the ground, which was paved with several colorful mosaics. I walked around while staring at the different mosaics on the ground and eventually found myself at the other side of the wall, where something else struck my eye. In the wall, there were several inscriptions. I started to read them and noticed that some of them were connected to the mosaics. One inscription was saying that one of the mosaics involves an ashtray and was made for one of the casualties as a reminder for all the smokes together. I started looking for the ashtray in the mosaic and got “lucky”. It was a bit of a strange feeling, because at one hand I felt like a happy and excited 5-year old again, going on a quest where I succeeded in. On the other hand, I thought about the person the mosaic was made for and tried to imagine how he or she might have felt while trying to escape the burning building in order to survive the crash. What struck me while looking at other mosaics was that at least two of them consisted of slivers of Israeli glass and ceramics. Only when seeing the second mosaic, I realized not only 39 residents of the Bijlmermeer area passed away during the disastrous event, but also four Israeli’s who were attending the flight (Muller, 2012). According to the sign next to the monument, the mosaics were made by residents and by relatives of victims, but also by caseworkers and rescuers that were involved in the crash too. While reading the sign I realized how big of an area the monument actually consisted of. Although having read about the monument beforehand, it only occurred to me then. Not only were the wall, the tree and the mosaic part of the monument, they had also preserved the outline of the collapsed buildings and called it “the Footprint”. With a brief overview of the monument in my mind, I turned back to the wall. I read some more inscriptions and noticed some old flowers and plants in simple pots on a shelf in the middle of the wall. Behind that shelf was a metal grid. As the architects Hertzberger and Descombes pointed out in the outline of their design, the metal grid in the wall serves as the former fence where, right after the disastrous event, people left mementos (Descombes and Hertzberger, 1999: 7). As far as I have seen there were no mementos on the day I visited the monument, except for the flowers. From my position of looking at the wall, I turned to the right and was now facing “the Tree that saw it all”. Like more trees, it actually has “eyes” and made its meaning all the more suiting and beautiful in my opinion. Around the tree was a square wooden bench for people to sit down on and get together. I put my bag down and decided to sit there for a while. That same moment a mother with a pram and three kids walked up to the monument. I could hear the mother explaining to her children what had happened there 24 years ago. They seemed impressed and walked along the different components of the monument. After a while, they disappeared along the promenade. Across of me, the white, concrete wall continued in a bow. There were more benches attached to the wall and I noticed some beer cans laying around one of them. I wondered if it had been disrespectful of the people to drink beers there. Or had they maybe drank the cans while commemorating one of the victims? After a while, I got up and decided to walk along the promenade too to have a look at the Footprint. I walked up to the promenade, a pathway that not only connects the Tree with the Footprint but also fulfills a metaphorical function. When the plane crashed into the buildings, firemen hurried to the disaster area. The promenade follows the same line as where the firemen found themselves during the disastrous event (Descombes and Hertzberger, 1999: 7). After a few meters walking on the promenade, I arrived at a small bridge, which crosses a small canal. On the right side of the bridge, you could see the Footprint where a bending slope ends in the canal. On the left side of the bridge, the canal goes on and ends in a pond. Next to the bridge, on a concrete plateau, there is a small fountain. According to the sign, this is the place where the plane crashed into the building. The water from the fountain stands for life and the hope a crash like this will never occur again (Sign of The Growing Monument, April 2016). In my opinion, it seemed as if the fountain stopped working properly since I did not at once notice it was there. I looked it up after my visit to the monument and it turned out the fountain always functioned very subtle (Weilacher, 2005: 44). I continued walking along the promenade and noticed there were some concrete sitting areas on the left side of the pathway. It consisted of low walls, which had benches and tables built into them, and were surrounded by trees as to provide a picnic area in the shade (Weilacher, 2005: 44). Looking at the trees I assumed those were the 25 lime-trees the sign of the monument (April 2016) spoke of. The trees were originally from the Museum Square in the municipality Amsterdam Zuid but were replanted in the park around the monument as a sign of the commitment in the aftermath of the crash of whole Amsterdam and their sympathy for the victims and their relatives (Sign of The Growing Monument, April 2016). The sign did not say who the author was, but it gave me goosebumps and the feeling as if I had lost someone in the crash too. Not only the poem but also the inscriptions in the wall made the disastrous event feel real to me. Although being only a baby when it happened, the words I read on the monument made it come to life and a feeling of sadness washed over me. I sat down on the square, wooden bench surrounding the tree again and went over my own youth, my own life and praised myself lucky with the family and friends I have and for being still alive and healthy. While conducting fieldwork I thus experienced a feeling of both sadness and thankfulness at the same time. Being there and reading all the names of the people that had died during the disastrous event, I was reminded of people that I lost myself, but also the ones I still have and share a life with. It got me thinking about life in general; about how special it actually is to have people caring about you and to have people you care about yourself. It thus made me feel sad because I do miss the people I lost and could not even imagine how it would be to loose someone in a crash like the Bijlmer air crash disaster. But it, strangely enough, made me feel happy and thankful too because I was reminded of people I care about, both alive or passed away. Memories are what, in my opinion, count in life and I am thankful for the ones I already have. Monuments like the Bijlmermonument are thus in my opinion not only to commemorate the victims of the crash and the disastrous event itself, but they can be valuable for everyone as a place to just stop and think for a second, to realize what one has in life. 2001 Toxic Fear: the Management of Uncertainty in the Wake of the Amsterdam Air Crash. In: Journal of Hazardous Materials. Vol. 88: 213-234. 1999 A Growing Monument: The Bijlmermonument in Amsterdam. In: AA Files. Vol. 39: 3-9. 1995 Disaster Planning and Risk Management in the Densely-Populated Western Parts of the Netherland. In: Build Environment (1978-). Hazards in the Build Environment. Vol. 21(2/3): 183-193. Informatie over de herdenking van de Bijlmerramp. https://www.amsterdam.nl/toerisme-vrije-tijd/evenementen/herdenkingen/herdenking-0/ (Geraadpleegd: 06/04/2016). 2016 Air Crash Investigation. Broadcasted: 17/01/2016. http://natgeotv.com/uk/air-crash-investigation (Geraadpleegd: 25/02/2016). 2012 1992 – 2012: Een gat in de Bijlmermeer. http://www.nrc.nl/nieuws/2012/10/04/1992-2012-een-gat-in-de-bijlmermeer (Geraadpleegd: 06/04/2016). 2012 De Bijlmerramp: één van de 168 vliegtuigongelukken in Nederland. In: HP de Tijd. http://www.hpdetijd.nl/2012-10-04/de-bijlmerramp-een-van-de-168-vliegtuigongelukken-in-nederland/ (Geraadpleegd: 08/04/2016). 2005 In Gardens: Profiles of Contemporary European Landscape Architecture. Basel: Birkhäuser – Publishers for Architecture: 43 – 48.